Chris Vincent received his Bachelor’s degree in Piano Performance from the Florida State University, where he also received a Master’s in Ethnomusicology. He arrived in Seattle in 1988 to pursue a Ph.D. at the University of Washington after living in Japan for five years researching Japanese traditional music and studying Yamada-School koto. In Tokyo he was also a piano accompanist for the Tokyo International Singers and organist/choir director at St. Alban’s Anglican Church. 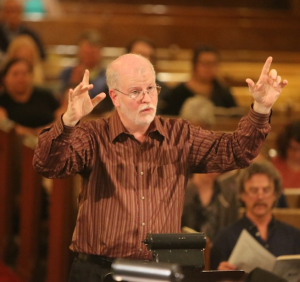 In Seattle he has taught music theory and world music appreciation at the University of Washington and the Art Institute of Seattle, and has conducted several choirs. He is a staff accompanist at the Cornish College of the Arts and the Music Center of the Northwest. Other local accompanying credits include the voice and opera programs at the University of Washington, the Seattle Opera Guild, Puget Sound Opera, the Master Chorus Eastside, the Seattle Lesbian and Gay Chorus, Showtunes! Theatre Company, Cascadian Chorale, Seattle Choral Company, City Cantabile Choir, and the Seattle Men’s Chorus. Besides the Sound Singers Japanese Choir, Chris also currently conducts the Market Street Singers (a 90-voice community choir in Ballard) and the Music Center Chorale.